January 23 marks National Pie Day. I have no idea who chose this particular date, why this day in late January should mark such an auspicious occasion, or how it received this designation. I guess it is another of life’s mysteries. However, I am all for celebrating a holiday honouring one of the most important dessert genres. National Pie Day also is close to the birthday of our friend and neighbour, P. P,’s spouse, L, is a gifted chef/food writer, who has a wonderful secret blog (or, “‘the blog that dare not speak its name,” or, TBTDNSIN). L asked me to bake a pie in honour of P’s birthday. I was happy to do so. 1. It was National Pie Day, of course; this trumped my customary baking a birthday cake. 2. There was a recipe I wanted to try from Pascale Le Draoulec’s charming book, American Pie. This is an excellent, memorable social history of small town America and an account of her road trip, with the culinary twist of seeking the best local pie, as she initially headed from San Francisco to New York. I had picked it up from a bookstore on Vashon Island, WA, last year, and devoured it very quickly (reading, rather than eating the book itself). 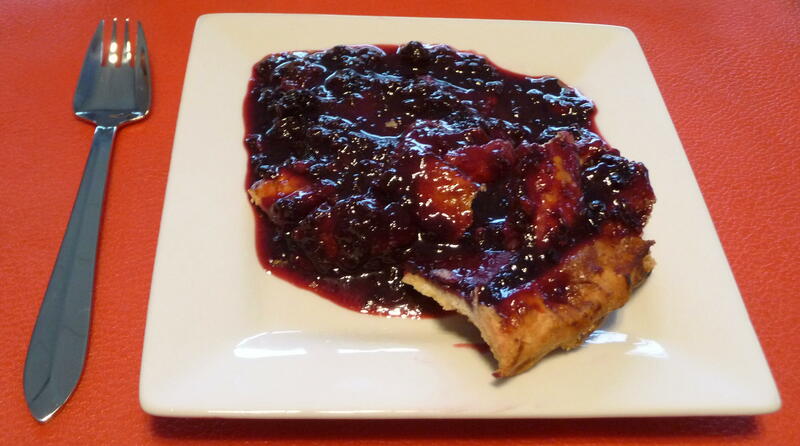 There are some promising recipes thrown in, including “Tootie Guirard’s Good Friday Blackberry Pie”, which accompanied an amusing anecdote about the pie tradition in Lafayette, Louisiana – a state which suffered tremendous disasters from Hurricane Katrina. 3. Some of the island blackberries, which I had picked and frozen last summer, thawed partially, after a three-day power outage last week. We had terrifying windstorms on January 17, which battered the Gulf Islands (at speeds up to 120 km/hour!). There were trees and branches down all over the islands, sort of a minor disaster here. Now, I am not the most experienced of pie bakers, especially when it comes to crust. I have done many cookie crumb/graham cracker crusts in my time; they are so easy, so non-threatening. Yet I discovered a great crust recipe last summer (you will see it at the end of this post – along with the three-berry filling, which worked perfectly, I might add, defensively…). I figured I would combine that crust with Tootie Guirard’s recipe. This was to be my first lattice-crusted pie, a nod to National Pie Day. I followed Tootie’s recipe, with a few minor adjustments. What resulted, however, made me think of a potential scenario for a kitchen-disaster episode involving the central character, “Tootie”, on the disaster of a sitcom, The Facts of Life. Or, if you really are fond of this show, here’s the all-grown up Kim “Tootie” Fields. The pie looked nice, if not a tad over-browned, fresh from the oven. I only had about two hours in which to let it cool before heading out for the mini-surprise party for P. However, walking over to our friend’s house, some of the filling sloshed over the lattice crust; we decided to drive, instead – something we never would do for the short five-minute walk around the bay. At our friends’ house, we even put the pie in their freezer for about half-an-hour or so, at the kind suggestion of the hostesses, but that last-ditch effort did not help it set up any further. As Tootie G’s recipe did not work for me, I will not include it here. I do not think that my recipe modifications were the reason for the pie not setting properly: additions of ½ teaspoon of cinnamon, ½ teaspoon of nutmeg, two tablespoons of cornstarch (in a slurry), with the zest and juice of one lemon. In fact, I did simmer the berries longer than the recipe called for (they were somewhat frozen when I started). The inclusion of cornstarch should have helped with the setting. For whatever reason, the filling did not cooperate, though the crust turned out to be flaky, tender, and flavourful – the trifecta of a perfect crust. Everyone said they thought the “pie” tasted good and even politely enquired what the spices were. Sometimes, your pie does not set up properly, but – like many other daily incidents in our lives – it still was good, in its own way. In retrospect, I should have named the dish, “Blackberry compote, with shards of lattice crust”…especially on the Day-Which-Honours-Pie. ·	Put a large baking sheet in middle of oven and preheat oven to 450°F. ·	Whisk together granulated sugar, cornstarch, tapioca, and salt, then toss with berries. ·	Roll out 1 piece of dough (keep remaining piece chilled) on a lightly floured surface with a lightly floured rolling pin into a 13-inch round and fit into pie plate. Trim edge, leaving a 1/2-inch overhang. Chill shell while rolling out dough for top crust. 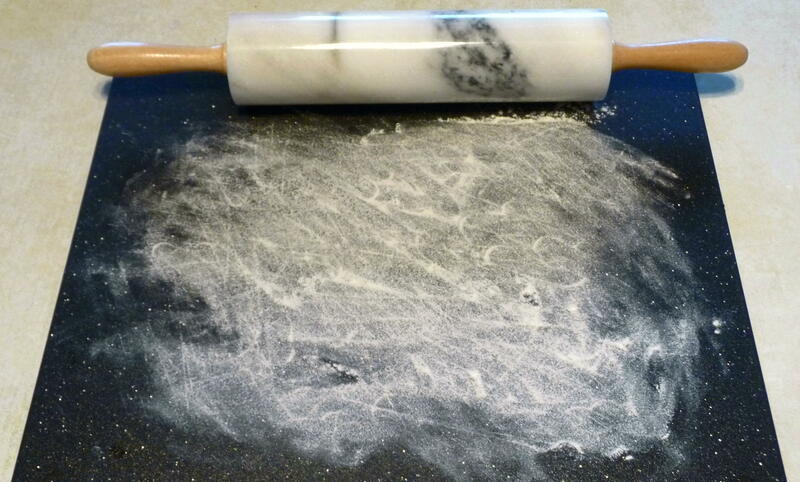 ·	Roll out remaining piece of dough on lightly floured surface with floured rolling pin into an 11-inch round. 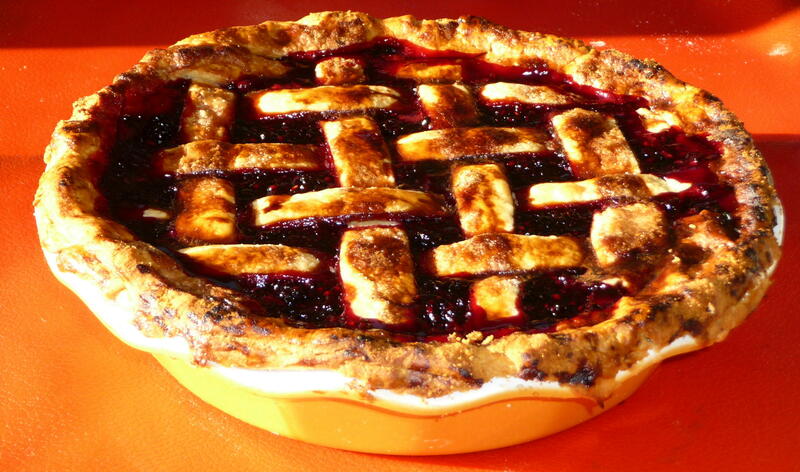 ·	Spoon filling into shell, then cover pie with pastry round and trim with kitchen shears, leaving a 1/2-inch overhang. Press edges together, then crimp edge decoratively. Brush top of pie with egg and sprinkle all over with sanding sugar. Cut 3 steam vents in top crust with a small sharp knife. ·	Bake pie on hot baking sheet in middle of oven 15 minutes, then reduce oven temperature to 375°F and continue to bake until crust is golden brown and filling is bubbling, about 45 minutes more. ·	Cool pie on a rack at least 3 hours before serving to allow juices to thicken slightly (filling will still be juicy). ·	Blend together flour, butter, shortening, and salt in a bowl with your fingertips or a pastry blender (or pulse in a food processor) until most of mixture resembles coarse meal with some small (roughly pea-size) butter lumps. Drizzle evenly with 4 tablespoons ice water and gently stir with a fork (or pulse in food processor) until incorporated. ·	Turn out mixture onto a lightly floured surface and divide into 8 portions. With heel of your hand, smear each portion once or twice in a forward motion to help distribute fat. Gather dough together with scraper and press into 2 balls, then flatten each into a 5-inch disk. Wrap disks separately in plastic wrap and chill until firm, at least 1 hour. These two recipes are from the late great Gourmet magazine (August 2003). This entry was posted in Baking, Dessert, Pie and tagged Baking, Dessert, Pie, Recipe. Bookmark the permalink. Like your mother I should like to make a reservation for dinner. How soon can it be? I have simply loved looking at ALL the recipes and my saliva is running like in Dr. Pav’s dogs. It is grand. Keep it up.